A veggie alteration to the classic Greek souvlaki ( suflaki / suvlaki )! 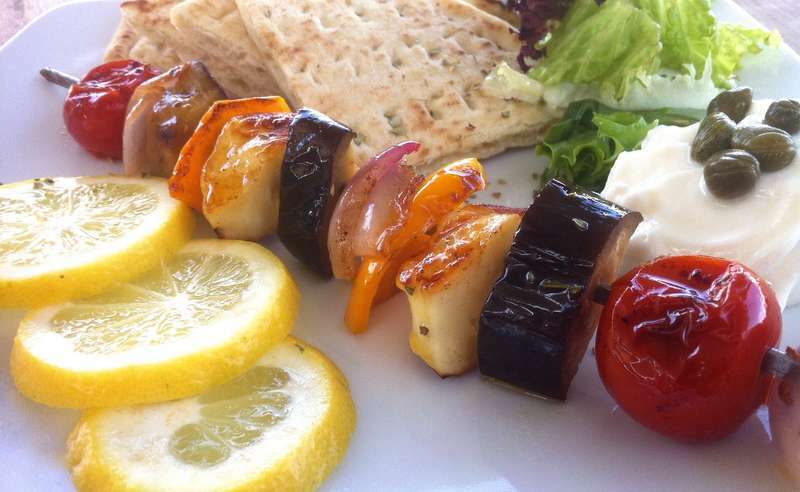 Colorful vegetables, salty halloumi cheese put together in a skewer and coated in a lemony marinade. If you haven’t tried halloumi before, you will be amazed by it’s unique texture and taste. Halloumi is a traditional cheese originating from Cyprus and is made from a combination of sheep’s and goat’s milk. This robust, salty cheese can withstand grilling or frying without losing it’s shape, as it has a really high melting point. Serve with a squeeze of a lemon, some warm pita bread and a dollop of thick Greek yogurt. Enjoy! To make these delicious vegetable skewers (souvlaki), start by preparing the vegetables. Halve and deseed the peppers and cut in 2 cm chunks. Cut the red onion into wedges and roughly chop. Top and tail the eggplant, cut it in half and slice in 2 cm chunks. Cut the halloumi cheese in 2 cm cubes and place in a large bowl; add the veggies, drizzle with the olive oil and lemon juice, sprinkle with dried oregano and season. Mix well with your hands, so that all the flavours blend. Preheat a grill or griddle pan on a high heat. Grill the vegetable skewers for about 12 minutes, turning once on each side, until nicely coloured and softened. Don’t forget to to bast with any leftover marinade, as they cook. In the meantime, warm the pita breads for a few minutes in the oven. Serve these amazing vegetable skewers with the warm pita breads, some leafy greens and a big dollop of Greek yogurt. Enjoy!